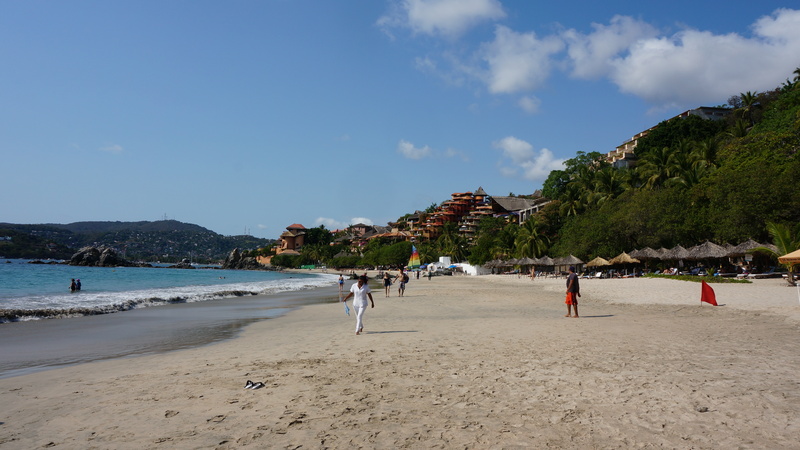 Something about beach life just makes everything slower …. like sleeping 9-10 hours a night ….. In the past we have stayed at Angela’s Hostel – it is now named Angelita’s Hostel – but closed and up for sale. 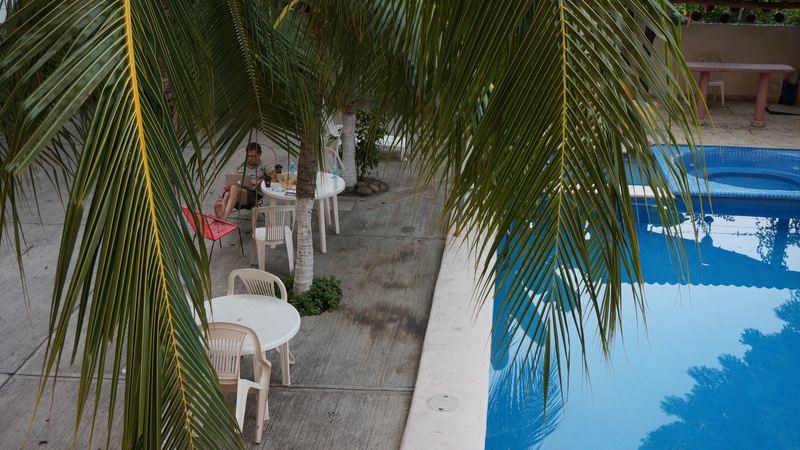 We chose a smaller hotel right down the street – Fiesta Paraiso. The beds are super hard, but otherwise the rooms are comfy and clean – and the pool is delightful. If we only had a kitchen it would be great for a longer stay. And – 400 pesos per night which is pretty close to perfect. 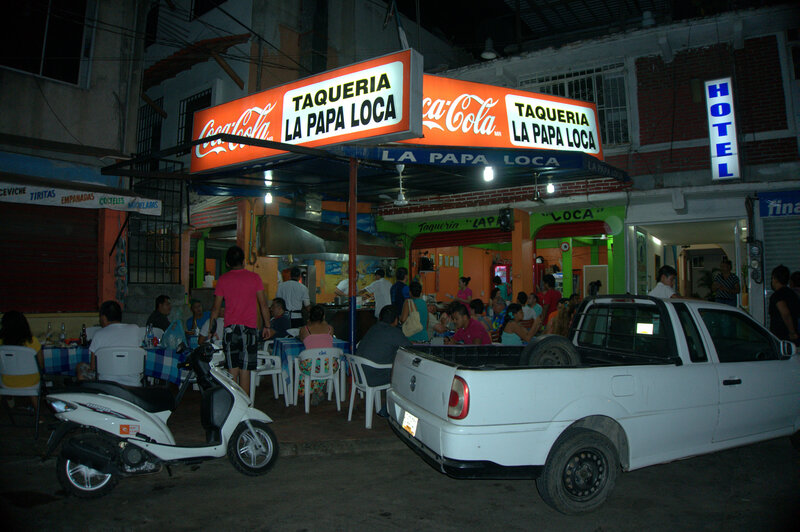 After our return from the beach we wandered up to a place recommended – Taqueria Papas Loca. This place takes baked stuffed potato to a whole new level. They had a whole row of baked potatoes ready to go, which they then stuff with your choice of fillings; I chose bacon, shrimp and tomato, Grant chose tacos al pastor, pork and pineapple. They were delicious! Huge too … we really should have shared! 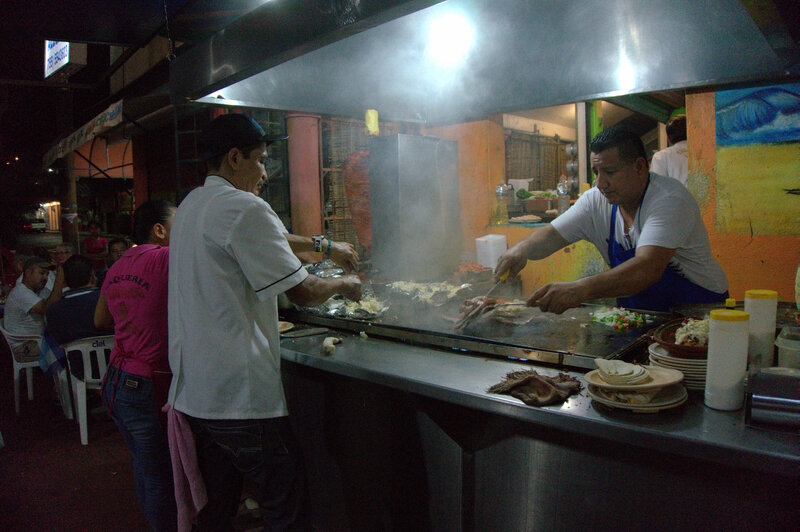 These guys work crazy fast – choices of toppings go onto the grill surface, cooked up and diced while the other guy opens the potato, stirs in sour cream and butter, mixes it all in together, toppings applied, cheese applied, lid on to steam it a bit, and presto … whew. As you can see – you are pretty much sitting in a parking lot. There is some seating indoors also thankfully under a fan. This place is crazy busy and the staff work like frantic bees rushing around. Just as many takeouts as eating in. Today’s activity was much like yesterday …. beaching it! 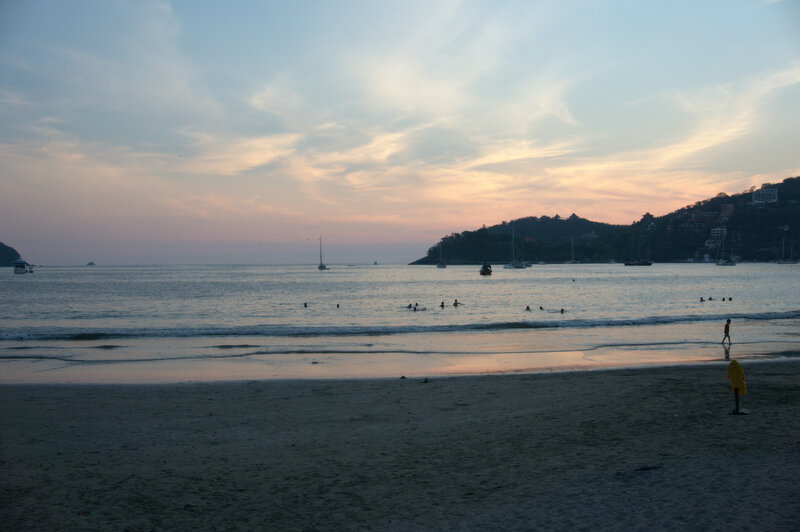 We walked to La Ropa beach and sat ourselves on the lounge chairs, much like the other Canadian and American tourists and sunned ourselves, swam in the waves and read our books – this after a 10 hour sleep!! 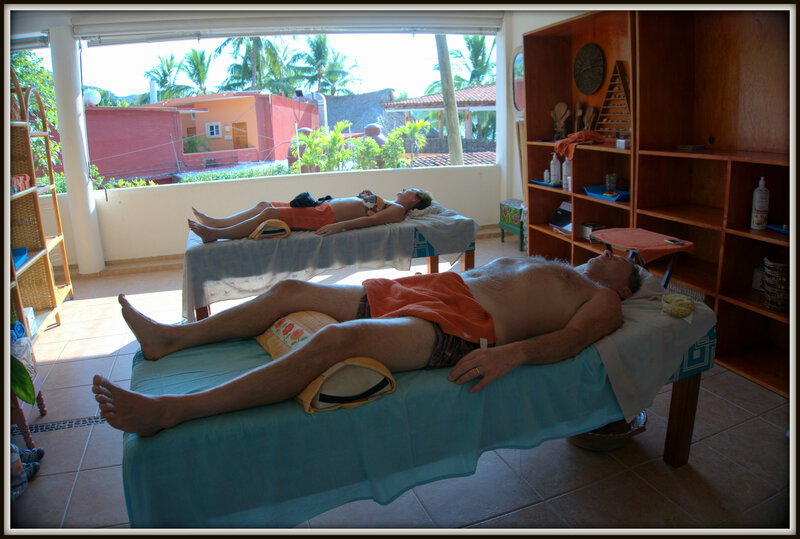 When we were exhausted form all that activity we dragged ourselves upstairs and enjoyed a massage with the sound of the waves crashing while we had a very therapeutic massage – those girls really knew what they were doing. Walking back we noticed an Italian getting his place ready to go, so ordered a Napolitano pizza (he is from Naples, and this is his specialty), tomato sauce, anchovies and capers. It was delicious, and we ate that as an appie beside the pool. 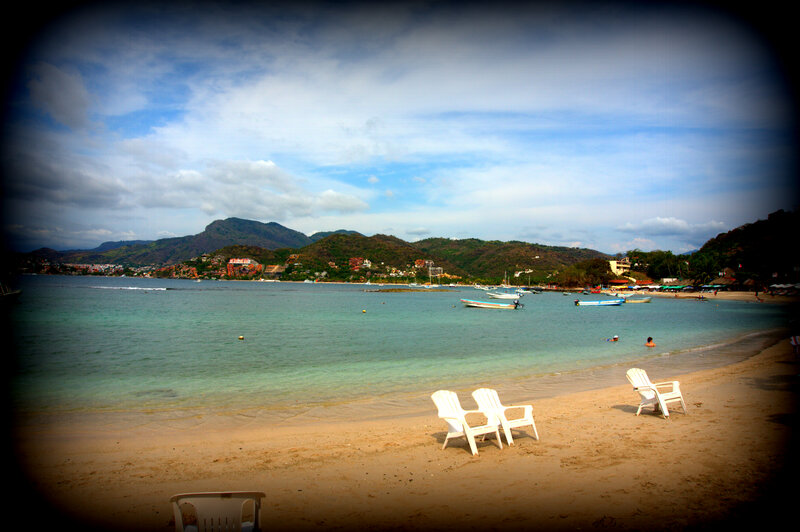 Tomorrow we are heading out – perhaps to Barra de Potosi, a very small beach town not far from here …. if it has adequate internet access you will no doubt hear from us there!